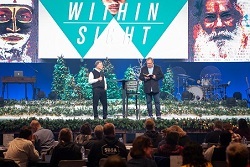 LAKE FOREST, Calif., Dec. 7, 2018 /Christian Newswire/ -- More than 600 attendees at the Finishing the Task Conference hosted at Saddleback Church Dec. 4-6 adopted the last of 343 unengaged people groups for gospel engagement in the coming year, marking a historic milestone in the effort to fulfill Jesus' command to "make disciples of every nation." "Our dream was that every known people group and ethnolinguistic group would be adopted, and as we sit here today, they are all adopted. Now the real work begins, and we will be praying as faithful men and women go to these remote places and risk their lives for the sake of the gospel," Paul Eshleman, Director of Finishing the Task Network, announced to the crowd. The Finishing the Task Conference is a yearly gathering of local churches, denominations, church planters, and mission agencies committed to seeing churches planted in every remaining unengaged and unreached group. Saddleback Church has hosted the gathering for the past five years. "We've been watching this number drop every year, and here we are. You are a part of history," Rick Warren, Saddleback's founder and senior pastor, told those gathered during his closing address. The remaining unengaged groups have never once heard the gospel, nor have they had access to a follower of Jesus or a local church. The commitment to send missionaries to these last groups represents a historic task for the global Church, charged by the Great Commission of Jesus to make disciples in all the earth. "It's time for the Church to stop debating the Bible and start doing it. It's time to stop criticizing and start cooperating. We want the Church to be known for love and not legalism, for what we're for, not what we're against. We know this task is going to take hard work, but it is so worth it," Warren said. Those assembled at Finishing the Task adopted the majority of the remaining 343 groups, and Saddleback had the privilege of adopting all the groups that remained at the end of the conference, continuing its focus on sharing the Gospel around the world through The PEACE Plan, Saddleback's missions model which harnesses the power of lay members in church to church partnership. For over a decade, Saddleback members have equipped local churches to serve their communities in the various aspects of PEACE: Planting churches that promote reconciliation, Equipping leaders, Assisting the poor, Caring for the sick, and Educating the next generation, and is now working to mobilize other churches to do the same across all of Africa and Latin America. In 2010, Saddleback became the first church to send members to every nation of the globe, and to date has seen over 25,000 members serve on mission. Saddleback will host a PEACE conference in October 2019 to help train local churches to harness the power of ordinary members to solve the world’s greatest problems. For more information, visit thepeaceplan.com. Finishing the Task is a global network of local churches, denominations, church planters and mission agencies that are willing to work together in partnership to see church planting initiatives launched among these 343 Unengaged, Unreached People Groups (UUPGs). For information, visit www.finishingthetask.com. Founded in 1980 by Rick Warren and his wife Kay, Saddleback Church is one of the most influential churches in the nation. It has 14 locations throughout Southern California, four international campuses, as well as an online campus. For information, visit www.saddleback.com.